SAN DIEGO -- Defibrillators, fluids and life vests -- these are the tools Border Patrol agents will need this summer. "We're always evolving as the smugglers are," explained agent Miguel Pena as he showed off an odd assortment of life-saving equipment at the agency’s offices in Chula Vista. Pena is a member of the BORSTAR unit, which stands for Border Patrol Search, Trauma and Rescue. Will the summer be busy? Pena’s job is part law enforcement, part medical assistant. Think of BORSTAR as the Border Patrol’s paramedics. "It's very dangerous crossing by yourself or with a smuggler -- very dangerous," warns Pena. 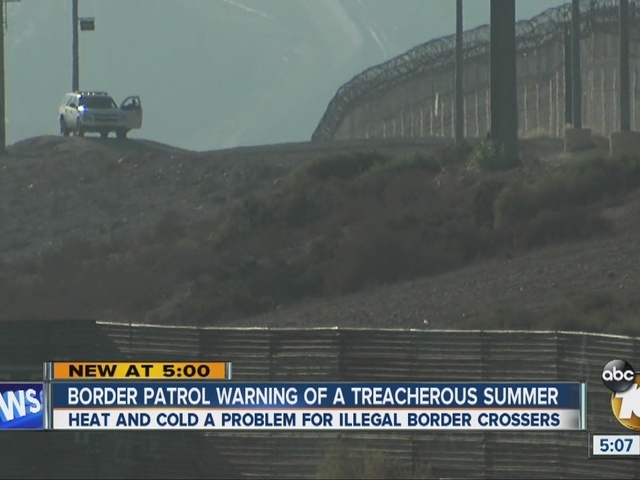 He says summer is particularly hazardous for illegal border crossers because of the heat. He remembers once helping a husband look for his wife in the burning sun. By the time they reached the wife, Pena explained, “it was too late.” Calls like that take an emotional toll. "You can't help but be sympathetic for his loss,” said Pena. Water rescues are also common in the summer. Pena says people will dive into the ocean, thinking they can swim across the border. “They get in the water… it gets really cold… they can get hypothermia quickly,” he said. The agency says the BORSTAR Unit was created 18 years ago to address the “growing number of injuries to Border Patrol agents and migrant deaths along our nation’s borders.